Aplizar, F. and Bovarnick, A. (2013). Targeted Scenario Analysis: A new approach to capturing and presenting ecosystem service values for decision making. UNDP. 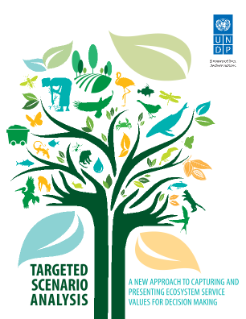 This guidebook provides a step-by-step introduction to Targeted Scenario Analysis (TSA), an innovative analytical approach, developed by UNDP that captures and presents the value of ecosystem services within decision making, to help make the business case for sustainable policy and investment choices.Through TSA, practitioners working with governments and private enterprises can generate and present data related to the management of ecosystems in a way that is more relevant to the choices facing a decision maker. This increases the likelihood that this data will be used to make policy and management decisions that result in effective and sustainable management of ecosystems and ecosystem services.